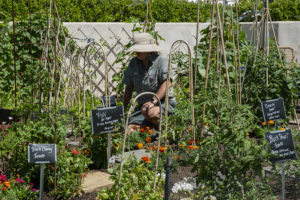 Chef's Garden : Executive Leader Coach @ dbkAssociates, Inc.
During a recent conference, I had the opportunity to visit the Chef’s Garden. It was a working garden for sure. By that, I mean that the Chef used the produce and herbs in her recipes. I’m guessing that the Chef also supplemented her yield with commercial herbs and produce since the small plot of land wouldn’t support all the food that this conference center provided for the restaurants and banquets. 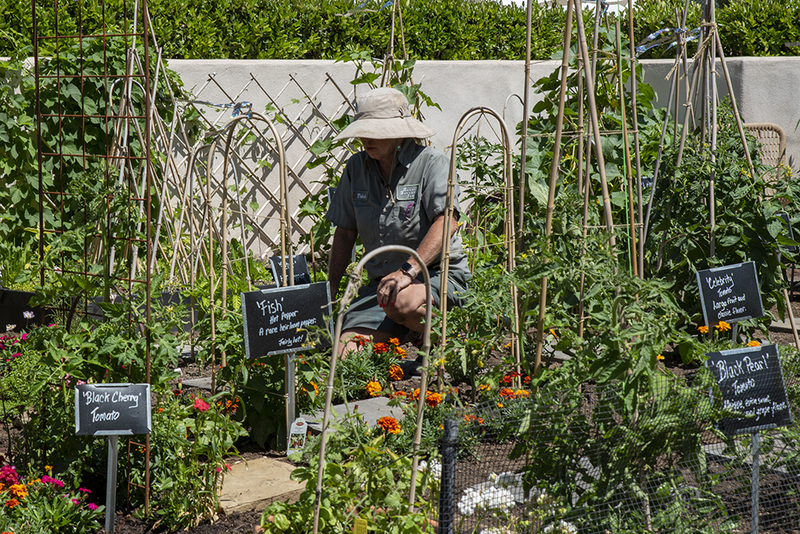 As I watched, the gardener carefully tended the rows of produce and flowers. The flowers, I’m told, were carefully chosen to keep some of the insects and animals away from the produce. And of course, they also added color to the garden. Carefully, the gardener pulled the weeds from around the produce and flowers. She explained that the weeds are quite prolific. They grow quickly and hog the moisture and soil nutrients. If the garden isn’t tended regularly, the weeds soon take over and the produce is starved. The gate to the garden had a cute sign requesting that we, “Please keep this gate closed regardless of what the rabbits say.” Ah yes! Weeds, rabbits, deer, insects — there are lots of enemies to the well-cultured garden. It occurs to me that gardens provide a reasonable analogy for business and for life. Like the garden, we must constantly attend to our organization’s culture or it will soon be overrun with weeds. There are people who seem to drain our culture of its vitality. Weed-people are toxic to the organization’s produce. And they seem to pop up overnight! Similarly, in our personal lives, it is often said that we “reap what we sow.” In addition to that, what we tolerate in our gardens is what will determine the quality and abundance of our harvest. Sometimes, in order to increase our yield or defeat the weeds, we resort to chemicals for our crops. We might add fertilizer and spread weed killer. Now we find that in our interdependent ecological systems, those added boosts to our produce may poison other systems — such as animals, ground water, etc. Likewise in our organizations, concentrating on one measure of our crop yield at the expense of others often results in negative unintended consequences. If we focus only on the top line, for example, we may find that the yield is poor — low or no profitability. Or we may find expenses going up due to employee turn-over as focus on profits takes away the compassion in leadership. There are many useful analogies for leadership and organizational development. They come from the military, gardening, travel and myriad other experiences. I find them useful because different analogies speak to different people in a way that helps them grasp deeper meaning. An example of an analogy woven into a story. Yet even great analogies fall apart if we push them too far. Instead, we may want to use them to paint the big picture. Stories are the most compelling way to communicate complicated concepts in a way that helps employees grasp the vision, mission, and purpose. I find it to be a fun exercise to take an experience and form it into a business analogy. And I try not to take the analogy too far. Have you figured out a solid analogy for your organization’s vision/purpose? Is everyone aligned to that vision? What’s your compelling story?